What makes the IN.LINE™ series unique, is that even though each full range module features a different horizontal coverage pattern, each IN.LINE™ module is engineered to operate in tangent with any other IN.LINE™ module, when deployed within the same “line array” column. All three modules can be combined in the same column to create seamless vertical coverage, (as determined by the size and curvature of the array) because all three full range modules have been designed to couple acoustically and form a single, undisrupted wavefront regardless of which horizontal patterns are chosen. Now, with the IN.LINE™ series, sound designers now have the ability to take advantage of the increased intelligibility, coherence and consistency of coverage that a line array solution can offer, yet can still create the highly specialized coverage patterns that the majority of complex acoustic installations require. Because sound designers can “mix and match” horizontal dispersion patterns within the same array, coverage zones can be easily defined and highly targeted, reducing unwanted reflections and acoustic “overspill”, all while maintaining a perfectly coherent vertical coverage pattern and highly consistent sound from the nearest listening position to the back of the room. Finally, the IN.LINE™ series features a price point which is competitive enough to allow contractors and their customers to realistically make the transition from traditional loudspeaker clusters to a line array technology without jeopardizing the contractor’s ability to win bids. 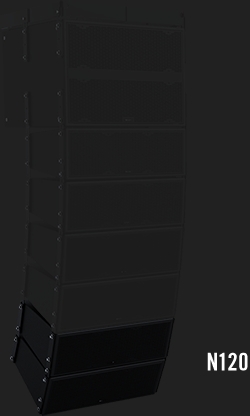 The N120 is a 2-way high/mid system line array module in a computer optimized enclosure. The N120 utilizes a 3-way biamplified complement of twin 8.8” cone drivers and a 1” exit extended high frequency compression driver. The enclosure is constructed of durable 12-ply void-free birch laminate, dadoed for strength and durability. All IN.LINE™ Modules ship with simplified rigging system which is designed to be set once and permanently installed. Perforated steel is employed for frontal protection of the loud speaker complement, hidden behind an attractive foam face. "McCauley Sound had the best price for sound reinforcement that was going to be a good fit for the size of the facility. Additionally, because they were able to hear it, the pastoral staff was very comfortable utilizing their budg..."